The Lowdown: Predictably but consistently funny, Amy Schumer is back in strong form after last year’s disastrous Snatched—and Michelle Williams steals every scene she can. I Feel Pretty tells a story that seeks to empower women to embrace their physical appearance confidently, regardless of how anyone else might view them. The hypocrisy lies in Amy Schumer’s character Renee Bennett wanting nothing more than to work for a cosmetics company. You’re all beautiful, women, just the way you are—so says screenwriters Abby Kohn and Marc Silverstein—but… you still need makeup. It’s a mixed message, but with that said I Feel Pretty remains a very funny movie. Trainwreck made comedienne Schumer a movie star, but she stumbled badly last year with the lackluster Snatched. Fans can breathe a sigh of relief—she’s back in fine form as Renee. Cursed with low self-esteem, Renee just wants to experience the type of breaks routinely enjoyed by glamorous “beautiful” women. After a clumsy gym accident knocks her unconscious, she wakes up believing her body has transformed into an unrecognizable work of irresistible art. Interestingly, she wants to ditch her decent-paying tech-based job at cosmetics firm Lily LeClaire and take a pay cut as their secretary. Though a step down it’ll get her foot in the door at their big city HQ. Now, believing herself to be a runway-model beauty, she has the confidence to chase her modest dream. Michelle Williams is sensational as Lily LeCaire’s CEO, Avery, who first takes an interest in Renee’s bigger ideas about marketing their product. Avery is the granddaughter of the company’s namesake (Lauren Hotton); though highly intelligent, no one takes her seriously because of her childlike voice. Williams takes what could’ve been a super easy paycheck, in a nothing supporting role, and makes it stick. The movie probably could’ve just easily focused on Avery rather than Renee. But I Feel Pretty is Schumer’s movie through and through. Renee, of course, hasn’t changed in appearance one iota—but Schumer has a field day showing us how her confidence has bloomed in the wake of her delusion. The plot turns ultra-predictable as Renee begins to turn her back on longtime friends Jane (Busy Phillips) and Vivian (Aidy Bryant) and transforms into the kind of person she formerly couldn’t stand. 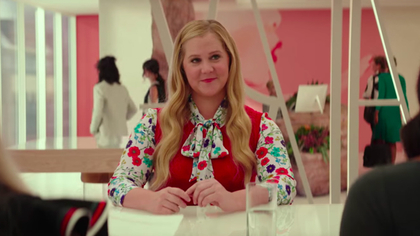 And much like the ending of Trainwreck, which basically sold out the ideas presented throughout the film by turning Schumer into just another bouncy cheerleader (literally), the aforementioned hypocrisy in I Feel Pretty dominates its final act. But again, it’s funny—especially in its more subtle, offhanded moments. And that’s pretty much all a movie like this needs to be.